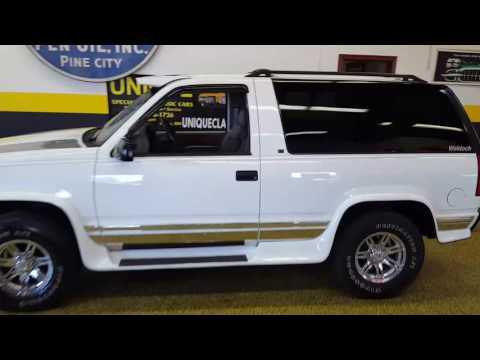 1995 Chevrolet Tahoe LT 2dr, VERY clean, 1 owner! TRADES? Here is one of the cleanest 2 door Tahoes we have seen in quite some time! The paint and interior has been well taken care of and it shows. If you're familiar with these at all, everyone knows how the seats wear. You can see in the pics how nice the leather seating area is in this one all the way through. It's riding on a set of chrome wheels and tires that have plenty of tread and life left in them. Powered by the ever popular 5.7 ltr./350 engine this Waldoch converted Tahoe is ready for the road. If you're wondering about the history of this vehicle it does have a clean Carfax and clear title. It's a one owner vehicle the we got out of Wisconsin and the Carfax will confirm that as well as the miles being original. These are getting harder and harder to find in this kind of shape, most have been abused or are rusted away. Mechanically this car is sound and goes down the road nicely, if you've been looking for one give us a call. Jay or Jeff at 507-386-1726 or email "sales@uniquemankato.com" ALL TRADES WILL BE CONSIDERED AND FINANCING IS AVAILABLE!